Can you tell what the mural is made of? Hover over the photo to take a closer look. No school should be so spoiled as to claim as their coach both the father of basketball and the father of basketball coaching. 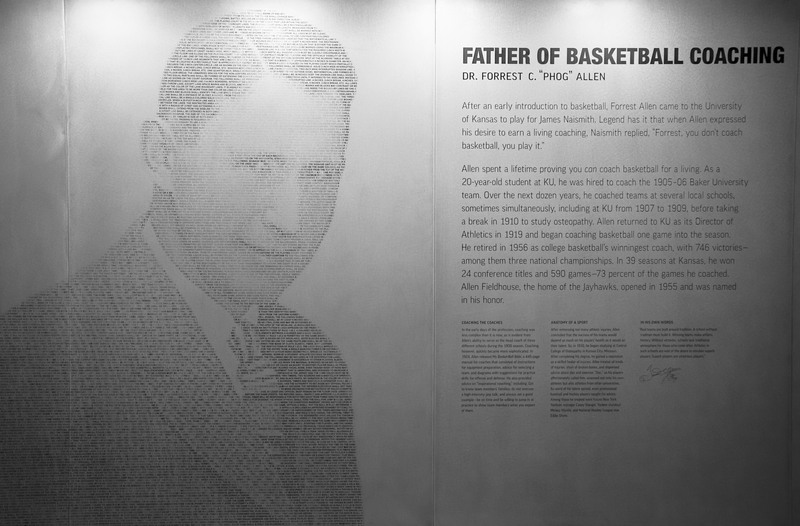 While the DeBruce Center focuses on Dr. James Naismith’s rules, it also pays homage to Forrest “Phog” Allen. Dr. Allen began his coaching career while still a student at KU, and solidified the school’s place in basketball lore with a 40-year career as KU’s coach. He retired as the "winningest" coach in the college ranks. The mural is created in the same fashion as the Naismith Mural with words from the contemporary rule book of basketball.